You will be landing at Gongkar airport and then driving to Lhasa at the distance of 60 Km and it would take you around an hour drive. On the way you will be visiting Nyethang stone carved Bhudha. Potala Palace is the winter palace of the Dalai Lama,built originally in the 7th century and expended to the present size by the 5th Dalai Lama in the 17th century. The Potala Palace is thirteen stories high and it has more than 1000 rooms. Jokang temple was built in the 7th century by one of the greatest Tibetan Kings called Songtsen Gampo. The temple is located just in front of your hotel and you can visit the Barkor street after the sightseeing of Jokang temple. Housing the most prized Buddhist relic and a 1300 years old Sakyamuni Buddha statue. The main section of the temple is topped with golden roofs found nowhere else except in Tibet . Temple is encircled by Barkhor Bazar with many shops selling all manner of goods from trinkets to Tantric ritual objects. Sera monastery and see the most interesting monks debating. Sera monastery was built in the 14th century by Jamchen Choeje,a famous desciple of Tsongkapa,the rounder of the yellow hat.Sera is one of the six biggest monasteries in Tibet . Norbulingka palace was ounded in the 18th century was the summer palace of Dalai Lama on the bank of Kyichu River . There are fountains, pavilions, terraces and stone tables where visitors may rest amidst the numerous kinds of flowers and fauna. This small palace has odd mix of traditional Tibetan architecture and modern paraphernalia, such as a Philips radiogram and Victorian bathroom fittings. Today you will be driving to Tsurpu monastery at the distance of 60 Km from Lhasa which would take you around 3 and half hours drive because of the rough road condition. On the way you will be passing by beautiful villages and they are both Nomads and farmers. Tsurpu monastery is the mother monastery of the Kagyu pa sect founded by the first Karmapa who is believed to be the first Tibetan reincarnated Lama. Today you will be driving to Gaden monastery at the distance of 70 Km. Ganden Monastery. It is the first monastery of the yellow hat sect, founded in the 14th century by Tsongka psa himself up in a hill at the distance of 60 KM from Lhasa . You can see beautiful Tibetan villages and yaks while you are driving up to the monastery from the main road. You can also see lots of Tibetan villages on the way from Lhasa to the monastery and all those villages are farmers. After the sightseeing, you will drive back to Lhasa . Today you will be driving to Digung Thil monastery at the distance of 170Km and the road condition is paved so it takes you around 3 hrs to get there. Dhigung Thil monastery is the mother monster of Dhigung Kagyupa sect and it has more than 600 years history. After finishing the sightseeing there, you will be driving to Lhundrup county at the distance of around 120Km. Today you will be driving to REting monastery at the distance of around 90Km via Chakla pass and it will take you between 3 and 4 hrs to get there. Reting is the moanstery of the Kadam pa sect in Tibetan Buddhism, founded by Dom tonpa in the 11th century. The monastery is beautifull located in the sandle wood, like surrounded by a small sandle wood forest. Today we will be driving to Lake Namtso , 180Km ,takes you there around 4 hrs . You will start the visit to Reting monastery for an hour starting from 9 Am and then at around 10Am you will head towards to Namtso lake and get you there around 1 Pm. In the afternoon, Explore the lakeand Tashi Do hermitage with numerous caves that you can visit while walkingaround Tashi Do hermitage and then return to Lhasa at the distance of 250Km and takes you back for around 4 hrs..
Today you will be driving to Tsetang at the distance of 160 Km along the Bharmaptra river via visiting Mindrol Ling monastery which would take you around 4-5 hrs to get there. Mindrol Ling monastery was built by Wugyen Tirdak LIngpa and it has more than a thousand years history. Today you will be visiting Traduk temple which is the earliest of Tibet great geomantic temple apart from Jokang temple. It was built by Tibetan King Songtsen Gampo on around 7th century.Yumbu Lhakang Palace was built as the Palalce of first Tibetan King Nyatri Tsanpo and it was used by the Tibetan kings till King Songtsen Gampo. Today you will be driving to Samye monastery at the distance of 50Km and Samye monastery was built in around 8th century by the 38th Tibetan King Trisong Detsen and it is believed to be the first Tibetan monastery of Budhism.After the sightseeing of the monastery, you will be returning to Tsetang which will take you around 2 hours. Today you will be driving at the distance of 380Km which will take you around 6hrs. You will be passing by Yamdrok holy lake, Nyochen Kansang and it¡¯s glaciers. 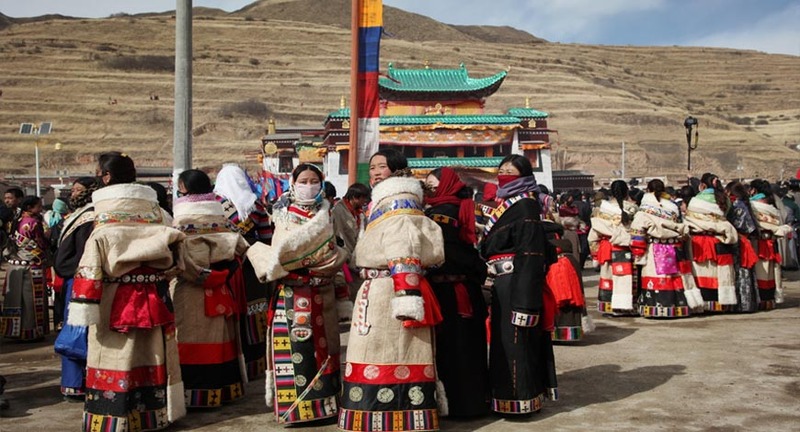 You will be visiting Samding monastery from Nakartse town just before Nyochen Kansang mountain. Today you will be visiting Palchoe Monastery which was built in around 15th century by local Chieftain Rebtan Kunsang as well as the Kubum stupa for the funerals of the death mother of Rebtan Kunsang. Gyantse was an important town on the trade route to India and Nepal .. Tour highlights Kumbum Stupa housing 100,000 Buddha and other statues and the towering remnants of Gyantse fort, attacked by the British Expeditionary forces of Col. Francis Younghusband early 20th century.After that you will be driving to Shigatse at the distance of 90 Km which will take you around two hrs and enroute visit Shalu monastery which was built in around 10th century by Loton Dorje Wangchuk. It is the second biggest city in Tibet . .
Today you will be driving at the distance of 180Km which will take you around 5 hrs and enroute you will visit Jonang Phuntsok ling monastery which was built in around 13th century and it is the school of Jonang pa school. Today you will be driving more than 200Km for both way and it will take you around 4 hrs for one way since the road condition is not good.Chung Riwoche stupa was built in around 15th century and it had association with both Sakyapa school and Tangthon Gyalpo Chaksma Tradition. Today you will be driving at the distance of 240Km and it will take you around 4-5 hrs. Sakay monastery was built in 12th century by Kon Kunchok Gyalpo as the school of Sakya pa sect and later on it was expended by Dogon Choegyel pakpa. It is the mother monastery of Sakya pa sect.The monastery was originally built for the schools of Sakya tribe and later on Dogon Chogyel Pakpa who was also the first Tibetan Lama who ruled Tibet expended it to the present size. Today you will be driving at the distance of 100 Km and it will take you around 3 hrs to get to Rongbuk Monastery. Explore Everest Base camp from Rongbuk Monastery by walk which will take 2 hrs. The Rongbuk Glacier is an impressive frozen ocean of ice waves the views of the glacier is the trail that expeditions use to begin their climbs of Everest Base Camp I, set in the barren world of moraine hills under beautifully sculpted yellow-orange cliffs. Today you will be driving at the distance of 180 Km with a view of great Himalayan range including mount Everest, Joyo, Shisha Bangma etc.It will take you around 6-7 hrs. Today you will do the immigration at Dzangmu and drive down to Friendship Bridge at the distance of 8 Km and then handover group to Nepalese agent.